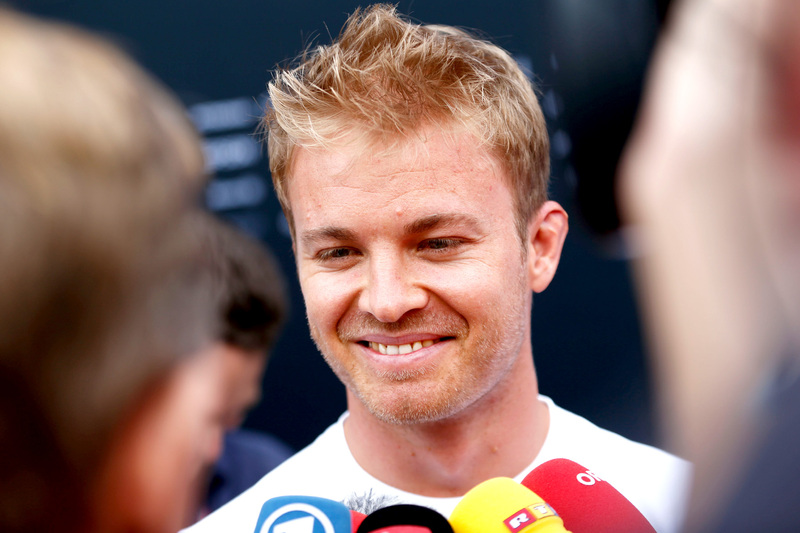 Nico Rosberg opened his home grand prix weekend by topping both Friday practice sessions at Germany’s Hockenheimring. Rosberg was unable to beat his morning session time of 1 minute 15.517 seconds in the afternoon session after the track cooled under overcast conditions, but neither could his teammate, Lewis Hamilton, leaving him 0.3 seconds clear at the end of the day. The German, who ceded his championship lead to Hamilton last weekend at the Hungarian Grand Prix, also held a marginal long-run pace advantage, judging by the pair’s race simulation laps. Sebastian Vettel was third quickest for Ferrari despite missing nearly 25 minutes of the session stuck in his garage with car troubles. The four-time world champion, for the first time appearing in front of his home crowd dressed in red, spent the last 30 minutes of the afternoon setting times on soft tyres, the middle tyre compound of the three available to the teams this weekend. Vettel’s best time, a 1 minute 16.208 seconds, was enough to better Red Bull Racing duo Max Verstappen and Daniel Ricciardo by more than two-tenths of a seconds, while Kimi Räikkönen’s second Ferrari was a few hundredths further back. “I think on one lap it’s going to be really close,” Ricciardo said. “Seb won the Ferrari-Red Bull battle, but I think we can get a little bit more out of one lap. “All going well tomorrow, we can qualify third. That will the target. Nico Hülkenberg was the highest-placed Force India car in seventh, almost three-tenths of a second off the top three and a further three-tenths ahead of the rest of the field. Jenson Button finished eighth-quickest for McLaren, but the Briton completed just 16 laps and ended the session in hospital for a precautionary check-up with an eye irritation. The ailing world champion, who was discharged later in the afternoon, led a tightly packed midfield; the 10 cars from P8 to P17 were separated by less than one second and comprised at least one driver from every team bar Sauber and Manor. Both Friday practice sessions proved straightforward affairs, with the only curiosity being the continuing debate about drivers exceeding track limits. Race control recorded 93 examples of drivers putting all four wheels over the white line demarcating the outside of turn one, though that number shrank to around 50 in free practice two. Max Verstappen was a particularly notorious offender, leaving the track 14 times in the morning session alone. At last weekend’s Hungarian Grand Prix the FIA trialled and successfully implemented a new electronic measuring system that eliminated the need for race control to monitor contentious corners with video evidence. The ‘three warnings’ system, whereby a driver is punished the fourth time he crosses the white line, proved controversial enough for some teams to lobby the FIA to roll back its hard-line stance on the matter, but race director Charlie Whiting was unmoved. “It was proposed by some that we should take a completely relaxed view on track limits,” he said on Friday. “I felt that was inappropriate — I think we should carry on doing what we do. “I think the difficulty in allowing complete freedom — i.e. going very wide there and no-one taking any notice of it — is that simply there would be a different track. It would be faster and there would be less run-off area, so we couldn’t possibly contemplate that. Whiting sent a note to the teams between the two practice sessions declaring that any driver judged to have driven off the track three times at turn one “would be reported to the stewards for not having made every reasonable effort to use the track”. Drivers will likely have their qualifying times deleted on Saturday afternoon if the sensors report them to have crossed the white line at any stage during the session.